Courtesy of Maui Home and Life. Wow! - so much for this price! Amazing Bi-coastal ocean and mountain views from this freshly remodeled large home + cottage on 1/2 acre of terraced gardens. Main home ground-floor has 3 bedrooms/2baths, huge great room featuring a lava stone fireplace & vaulted ceilings, separate dining room, large kitchen with new stainless appliances. Lower level has 2bedrooms/1bath with two great rooms and a wet-bar with new appliances. It's like having 2 homes in one; each set up for convenient living, sporting double laundry facilities, large garage on main level and carport area down below the main partly covered sprawling lanai . So much storage throughout! Tremendous ocean views from both levels! Clean, bright, open and airy! All rooms are generously sized. The cute detached cottage is very private and away from main home. Terraced gardens with many fruit trees (citrus, papaya, starfruit, banana). A fantastic large family home or multiple rental possibilities. Wonderful location ...walking distance to public swimming pools, shopping center and Pukalani school. 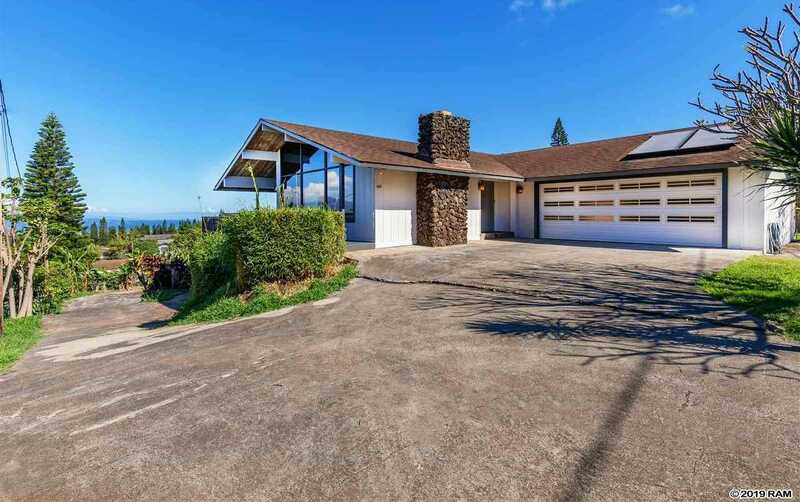 Please, send me more information on this property: MLS# 382242 – $998,900 – 188 Haulani St, Pukalani, HI 96768.